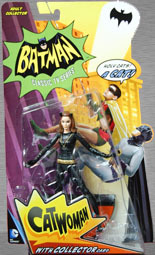 Say what you will about Mattel, they're certainly not rushing their Batman '66 line. It was January of 2012 when WB announced they'd finally worked out the rights to the show, Toy Fair 2013 when the toys were revealed, and then that fall before they came out. Just as those toys were shipping, news came out that a deal for likeness rights had been struck with Yvonne Craig - so naturally, it's taken about two more years for a figure of her to show up. Who's that fiercely-fighting peacekeeper in purple? Why, that's Batgirl! When criminals are up to no good, Barbara Gordon is ready to bring them to justice. With the push of the secret Batgirl Room Instant Re-Transformer, she rotates her bedroom wall to reveal her costume and suits up for a tantalizing transformation. Using her instincts and intellect, she can get herself out of the stickiest situations and even, quite literally, unbound. Holy show-ups, that Batgirl! Batgirl was introduced to the third season of Batman in a bid to save the show from cancellation - the ratings had dipped wildly in Season 2, so ABC had to be convinced that it was worth picking up. Meaning that (not for the last time) Batgirl saved Batman and Robin's lives. ABC almost greenlit a Season 4, too, which would have seen Batgirl replacing Robin full-time, but then decided against it. 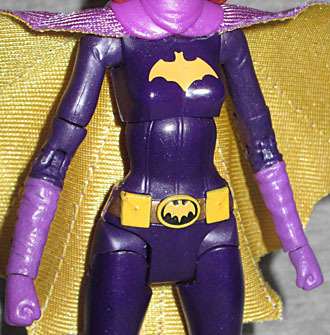 Batgirl was played by Yvonne Craig, and the likeness here is on par with all the other figures - which is to say, it looks like her, but has incredibly soft details. Is this because the show predates HD, so Mattel thought we'd be confused if the toy wasn't molded to look as blurry and out-of-focus as the characters on the screen? 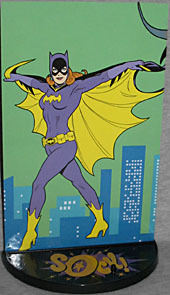 Batgirl's costume (designed to appeal both to "idealistic young girls and less high-minded older men") is purple and yellow, serving as inspiration for her current look in the comics. And in return, this toy seems to take some influence from the comics: the sculpt took what (on the TV costume) were just simple seams, and made them thicker and more prominent; basically, this looks like seams on a leather jacket, not on a stretch-lamé leotard. There are similar seams on the lower legs, but not on the thighs - are those reused from Catwoman? Her boots, gloves and utility belt are sculpted elements, but her unique batsymbol is just painted on. The one on her chest. The one on her belt is just as sculpted as the rest of the belt. Her cape is softgoods, but since it doesn't have the posing wires Batman and Robin had, you can't do anything with it. It doesn't even weigh enough to hang down, so it will constantly be splayed out behind her. On the plus side, this time there's no humongous tag that you have to cut off. The figure has a balljointed neck, swivel/hinge shoulders, swivel biceps, hinged elbows, swivel wrists, swivel torso, H-hips, swivel thighs, hinged knees, and hinged ankles. That's just as much as the boys, not that she'd be allowed to use it anyway: during the production of the show, she wasn't allowed to do anything other than Rockette-kick the villains, because actual hand-to-hand combat was "unladylike." You can see the same thing in other old female-led shows, like Wonder Woman or The Bionic Woman. In fact, Yvonne Craig once suggested the reason Honey West got cancelled was because Anne Francis "was always going around clobbering somebody, and you can't look feminine when you're doing that." She also said "if a girl goes on a date and a fellow gets fresh, she can't very well give him a karate chop for a good-night. But if she ducks, she's simply adept and feminine." Yeah. We've come a long way, baby. 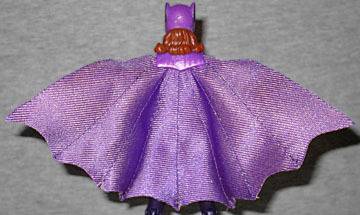 Batgirl has no accessories, just the same 4¼" x 2⅜" semi-circular display base that all the solo-carded figures came with. The sound effect sticker on top of the base is a yellow "SOCK!" with a purple burst behind it. But like we always say, Mattel never met an idea they couldn't do wrong, so the cardboard insert designed to fit in the back of the base is an entirely different size than all the other ones. It's a line-art version of a famous Batgirl publicity still, and looks very nice, but it will never fit in with the other figures in a display. Top-notch work, Mattel! 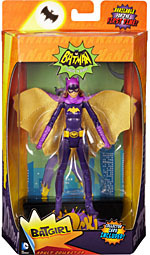 And speaking of not fitting in, Batgirl is not sold in the same kind of packaging as the other figures. Instead, she's in the kind of boxes Marvel Legends come in now. The colors and graphics are the same style that the other toys have used, but there's a huge difference between this and the normal cards. Obviously that's not really something that is going to bother us for any amount of time longer than it takes to get Babs out and the box into the bin, but you just know there's someone out there who's going to be driven mad by it. The Batman (Classic TV Series) line had massive buzz when it was announced, but it swiftly petered out. This figure should have been at retail a year ago, not released as an SDCC exclusive. Or if she was going to be released as an exclusive, there should have been something special about her: you know, include her bike or something. Instead, the Batgirl figure doesn't rise at all above her fellows. We hope this line isn't dead, because the figures are nice (and it would be fun to get characters like King Tut and Egghead), but it certainly doesn't feel like there's much hope for the future. 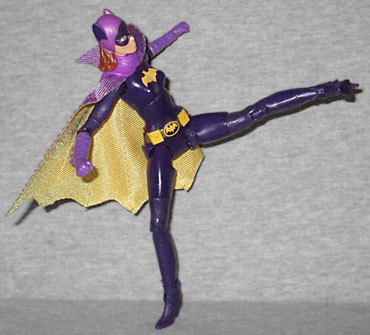 So if you ever want a Batgirl to complete your team, this exclusive may be your only shot.